This still from an ATK webcast shows a side view of the five-segment solid rocket booster DM3 during a Sept. 8, 2011 static test firing at the company's motor proving grounds near Promontory, Utah. This story was updated at 10:41 p.m. ET. PROMONTORY, Utah — A full-scale test of the world's largest solid rocket motor, which was originally envisioned to power a new NASA rocket, went off without a hitch in Utah's high desert today (Sept. 8). Built by Utah-based Alliant Techsystems (ATK), the five-segment solid motor ignited just after 4 p.m. EDT (2000 GMT) in a fiery burst followed by two minutes of a deafening roar. The test, called Development Motor 3 (DM3), shook the desert and surrounding mountains and sent massive columns of smoke billowing into the clear blue sky above. But ATK's giant solid rocket booster, which is similar to the twin rockets used to launch NASA space shuttles for 30 years, could see new life as part of NASA's latest heavy-lift rocket plan, called the Space Launch System, or SLS. The rocket booster could also serve as a component of a proposed commercial launch vehicle called Liberty, which ATK has been discussing with the European aerospace firm Astrium. 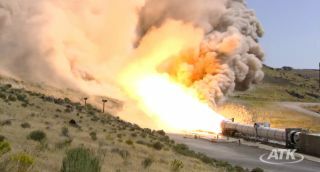 This still from an ATK webcast shows a wide view of the five-segment solid rocket booster DM3 during a Sept. 8, 2011 static test firing at the company's motor proving grounds near Promontory, Utah. Hundreds of space enthusiasts and dozens of news agencies watched the test, which was a ground-based static firing rather than a launch. The large rocket motor lay on its side during today's firing. After countdown and ignition, fire exploded through the center of the rocket case and burned through the solid fuel ignition material. Seconds later, a roar sounded for two full minutes. The motor carries a thrust capacity of about 3.6 million pounds, or 22 million horsepower. The motor itself is made of five segments that measure 12 feet (3.7 meters) in diameter. Its total length is 154 feet (47 m). Thursday's test simulated a rocket launch on a hot summer day. Two previous tests simulated winter and springtime conditions. In today's demonstration, the DM3 motor was heated to about 90 degrees Fahrenheit (32 degrees Celsius) before countdown. During the test, the fire reached a temperature of about 5,000 degrees Fahrenheit (2,760 degrees C), officials said. New technologies used to gather data worked perfectly during the ground test, ATK Vice President and General Manager Charles Precourt said in a post-test press conference. Early results showed that 10 ultrasonic sensors used to measure the thermal protection in the nozzle of the booster worked perfectly. "At this point and time it’s a complete success for us and we’re really pleased about that," Precourt said. The test used nearly 1,000 different instruments to gather data on about 40 different objectives. The rocket motor will be certified to fly at temperatures ranging from 40 to 90 degrees Fahrenheit (4 to 32 degrees C). This still from an ATK webcast shows a top-down view of the five-segment solid rocket booster DM3 during a Sept. 8, 2011 static test firing at the company's motor proving grounds near Promontory, Utah. The motor is also a key piece of the Liberty rocket ATK is developing in cooperation with Astrium. ATK and Astrium hope Liberty could be a contender to transport NASA astronauts to low-Earth orbit. The vehicle could also loft cargo and satellites to orbits around our planet, ATK officials have said. Liberty could be ready for its first test flight in 2013, with operations perhaps starting two years later, officials have said.